Previously on Rizzoli & Isles: Jane’s house burned down, her personal data got hacked, and Maura was kidnapped in connection with the case highlighted in Rizzoli & Isles 6×12, a.k.a. the season 6A finale, although the exact nature of that connection wasn’t clear. Read on for our recap of Rizzoli & Isles 6×13, which shed some light but left other questions unanswered. At the beginning of Rizzoli & Isles 6×13, Jane is at the scene of Maura’s abduction, along with the rest of the BPD team. Her voice is even huskier than usual, but alas, it’s not for a good reason (like being super hot for Maura); rather, she’s distraught. Nothing aside from Maura herself appears to be missing – it seems the kidnapper, much like Jane, didn’t want anything but Maura (ba-dum-chhh). The investigators don’t have a lot to go on beyond blood, a phone number, and a footprint. Jane hones in on the last call Maura received on her cellphone, which was from an internal BPD number, and sends Frankie to track down its origin. Could the abduction be an inside job? She blames herself for what happened and beats herself up about not being there to look out for Maura when Maura needed her. (If you cast your mind back to episode 6×12, you’ll remember that Jane followed a red herring of a clue that made her fearful for her mother’s safety, which resulted in Maura being alone at headquarters when she received the call to the scene.) Korsak tries to reassure her that she did the right thing by looking out for the people who most needed protecting. “Maura is strong, she’s smart, she’s capable,” he tells Jane. That’s sound advice, but it turns out Jane isn’t the only member of the Rizzoli clan struggling to cope with Maura’s abduction. When Mama Rizzoli brings Jane and Frankie bagged lunches (which is sweet) while Jane’s sitting at Frost’s desk (which is bittersweet), she reveals she’s not holding up terribly well either. Give that woman a Mother-in-Law of the Year Award, stat. Next, Jane and Korsak talk to the head of operations at the BPD, who said he was recently contacted by an eighth-grader who wanted to know about the department’s protocol for handling calls. Nina explains that this seemingly innocent inquiry led to a call-spoofing situation wherein a number appeared to be coming to Maura’s phone from the BPD when it actually wasn’t. As for the “teenager” who made the call, Nina shows Korsak how easy it is for an adult to modulate his or her voice to sound like that of an eighth-grader. In short, there’s an app for that. The good news? Maura’s abduction wasn’t an inside job. The bad news? Her abductor is being careful to hide his tracks, and he’s smart enough to do a pretty good job of it. But is he smarter than Maura? Speaking of white males of European descent, Kent finds a trace of lead paint and concludes Maura’s being held at an abandoned government building. He gets Jane up to speed, then promptly tells her she looks awful. He’s as tactful as ever; no wonder Jane prefers girls. After Kent suggests Jane take a nap and cites a statistic about NASA pilots to support his recommendation, Jane tells him to “take [his] fact and shove it up his…” before morosely heading to Maura’s office. Real talk? Kent is a tool. Given Jane’s level of exhaustion, it’s not that big of a surprise that she falls asleep in Maura’s office while going through the files of individuals who were imprisoned with Leanne, the murder victim from episode 6×12. Basically all she has to link Leanne to Maura’s case is the appearance of a wrist sporting a tattoo resembling Leanne’s in the video of her apartment being torched, but, hey, desperate times lead to Jane grasping at straws. While asleep, Jane dreams of dearly departed Senior Criminalist Susie Chang, who tells her, “Don’t worry, Jane, we’ll take good care of [Maura].” While it’s a pleasant surprise to see actress Tina Huang back on the show, albeit briefly, the circumstances are less than ideal. With Jane emotionally compromised, the rest of the team leaps into high gear to compensate: Korsak rounds up purchase orders and contracts for all the government buildings in Massachusetts, which will enable them to determine which building was painted in an order that matches the layers of paint in the chip, Kent volunteers to help sort through the potential candidates, and Nina pulls cellphone records. Remember Joe Harris, that creepy psychiatrist from Rizzoli & Isles 6×12? He was in the area of Maura’s abduction around the time that the incident occurred. Could it just be a coincidence, or is Nina onto something? Either way, Jane’s grateful for her effort. Points to Nina for not finishing that sentence with “broken up over the sudden disappearance of your soul mate,” which would’ve been just as true. Jane’s colleagues aren’t the only ones stepping up; Angela does her part by calling Maura’s birth mother, Hope, to fill her in on the situation. I have to say, I was pleasantly surprised to hear Hope referenced in Rizzoli & Isles 6×13, as she was one of those characters who popped in and out of the R&I universe never to be seen or heard from again. Maybe we’ll see actress Sharon Lawrence back on the show soon? Meanwhile, Jane has her “murderous rage” face on. She heads to the prison to talk to the warden, who gives resident psychiatrist Joe Harris a glowing review but allows Jane to search his office anyway. Jane quickly finds balloons like the ones found in Leanne’s stomach, and the next scene confirms what we’re all now thinking: Joe abducted Maura. During a conversation in which Maura attempts to glean the reason behind her kidnapping and Joe’s hatred for Jane, Joe reveals that he’s looking forward to seeing Jane “play the ineffectual detective as she watches [Maura] die.” Well, that sounds pleasant. Cut to Jane thinking aloud to the non-English-speaking janitor as she rattles around the BPD kitchen in a sleep-deprived haze. It’s a funny scene in the midst of a predominantly tense episode – and we get to hear Angie Harmon speak Spanish for a few seconds, which is positively drool-worthy if you’re into that sort of thing. Back at the dilapidated asylum, Joe’s on the phone with his accomplice, who tells him he’s been made. In a rage, he stomps on his phone, chloroforms Maura, and heads for the hills. Not long afterward, Jane and the gang burst into the building. It seems deserted, but Jane deploys the Super Sniffer (any Psych fans reading?) and detects “that perfume Maura wears – Eau de Something.” They correctly deduce that Joe had been holding Maura at the asylum but was given a heads up to flee. Is it possible they wrote off the inside job theory too quickly – but instead of a member of the BPD being Joe’s informant, it’s someone from the prison? Say, the warden Jane spoke to earlier? When Jane finds the room where Maura was held, she also finds a clue left by Maura: the word “Tunnel.” In the aforementioned tunnel, Maura slashes at Joe with the piece of metal she grabbed from the room and then flees, with a badly wounded Joe trailing behind her. Kent notes that the paint chip Jane found at the scene of Maura’s abduction had never been exposed to hot air, which writes off tunnels built for vehicles to pass through. The blueprints Nina accesses don’t show that the asylum has any tunnels, but Mama Rizzoli remembers a cave-in that hit the headlines a while back. As R&I writer Jeremy Svenson tweeted, “Mama Rizzoli’s old-time Boston history to the rescue!” Nina scours old newspaper records and sends what she comes up with to Jane, Korsak, and Frankie, who are in the bowels of the asylum searching for the tunnel. Korsak finds the entrance hidden behind an old bookshelf, and the trio ventures in. According to Nina, there are two sets of tunnels. They split up, blatantly disregarding horror movie etiquette despite the fact that they’re basically in a horror movie. Jane and Korsak take one path and Frankie takes the other. Jane and Korsak hear thuds up ahead and draw their weapons, but the person they come across is Maura, not Joe. Maura’s almost too terrified to speak, but she manages to warn Jane and Korsak that Joe isn’t working alone. Korsak stays with Maura while Jane goes up ahead, where she finds a wounded Frankie whose encounter with Joe left him worse for wear. Despite a gash on his head, Frankie insists he’s fine and urges Jane to continue on, setting her up for a showdown with a bloody Joe. Jane ends up shooting Joe and then trying in vain to get the name of his accomplice before he dies. “Why me?” she asks, to which Joe counters, “Why not?” and then dies. 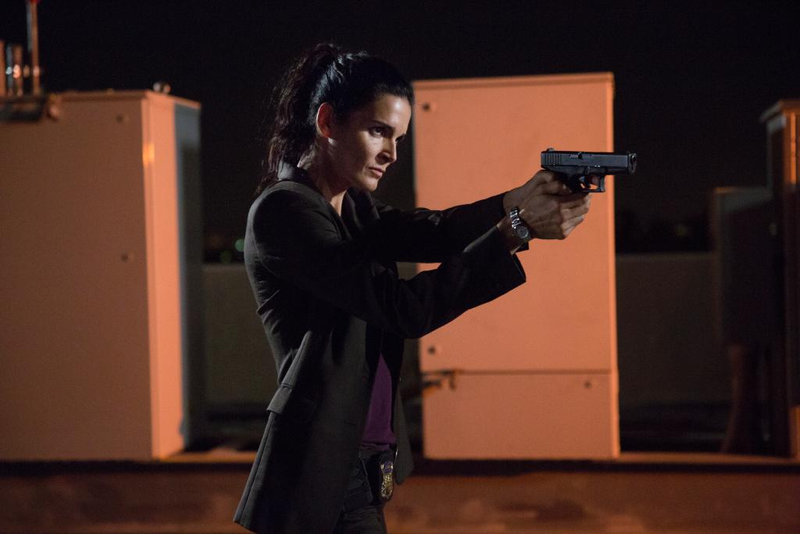 With the threat of Joe neutralized, Jane rushes to Maura’s side. They weep at each other, Jane promises to visit her in the hospital as soon as possible, my heart grows three sizes, etc. etc. As Maura gets loaded into an ambulance, Jane heads over to talk to Korsak, and we get another rare moment of levity for an episode as intense as Rizzoli & Isles 6×13. What did you think of Rizzoli & Isles 6×13? Check back soon for our recap of the episode that aired immediately afterward! The reply box on this webpage is nearly invisible. I hope my belated praise for your recaps is visible. Thanks for the Rizzles focus and humor.